Please call owner David at 701-371-3056. 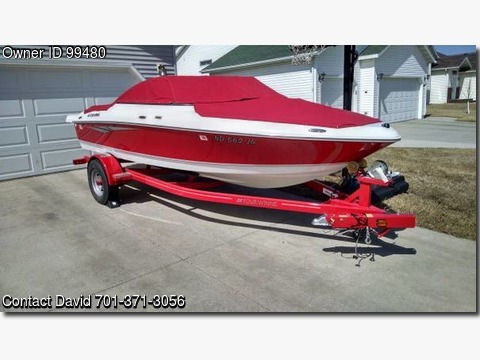 Beautiful red & white 2012 H180 for sale, LOA 19’8″, 4.3 V6 carbed eng. Includes bow and cockpit snap-on covers, snap-in carpet, optional extended swim platform,depth monitor, folding seat bolsters, AM/FM/CD, iPod connection, 2 anchors, bilge pump, full gauges, hydraulic steering, slide-out cleats, swivel seats. storage, Trailer has swing-away hitch to save storage space. Has 3 summers of low hour recreational use.